Theme of Rare Disease Day 2019 : 'Bridging health and social care'. U S President Donald Trump and North Korean leader Kim Jong-un met each other on in Hanoi, Vietnam, beginning the 2nd summit between the two countries. The White House has said that no agreement has been reached with North Korea after the second summit. In a statement, the US said that the two leaders had a "very good and constructive meeting" and their teams "look forward to meeting in the future". Trump said that the summit with North Korea failed to reach an agreement due to North Korean leader Kim Jong-un's demands to lift all US-led sanctions. In a significant gain for India in its push to isolate Pakistan internationally on the issue of terrorism post-Pulwama attack, China and Russia agreed for a closer policy coordination to eradicate the breeding grounds of terrorism. Their commitment came at the conclusion of the Russia, India and China Foreign Ministers' meeting at Wuzhen in the east Chinese city. In a joint communique, the three nations said, extremist groups cannot be supported and used in political and geopolitical goals. External Affairs Minister Sushma Swaraj along with Chinese Foreign Minister Wang Yi and their Russian counterpart Sergei Lavrov called on the international community to strengthen UN-led global counter-terrorism cooperation by fully implementing the relevant UN Security Council (UNSC) resolutions. 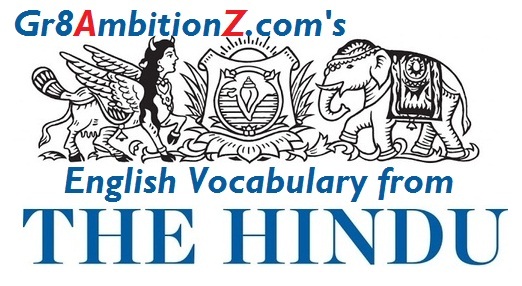 Hindu Editorial Topic 1 : "Calming Arunachal"
France is working on a proposal to ban chief of the UN-proscribed Jaish-e Muhammad (JeM) Masood Azhar after it assumes the Presidency of the powerful UN Security Council in March. The Pakistan-based JeM claimed the responsibility of the heinous suicide attack in Jammu and Kashmir's Pulwama district on February 14 in which 40 Central Reserve Police Force (CRPF) personnel were martyred, sparking outrage in India. Following the incident, India bombed and destroyed JeM's biggest training camp in Balakot in Pakistan's restive Khyber Pakhtunkhwa province, about 80-km from the Line of Control yesterdat, killing a "very large number" of terrorists, trainers, senior commanders and groups of jihadis who were being trained for fidayeen action. At the Russia-India-China Foreign Ministers meet in China, India's representative Sushma Swaraj said Pakistan denied knowledge of Pulwama attack instead of acting against Jaish-e-Mohammed even after calls by international community. United States today firmly asked Pakistan to take meaningful action against terrorist groups operating on its soil and underscored the importance of avoiding escalation at any cost after India targeted terrorist camp in Pakistan. US Secretary of State Mike Pompeo in a telephonic conversation with the Pakistan Foreign Minister Shah Mahmood Qureshi called for avoiding military action. Sampriti 2019, a joint military exercise between India and Bangladesh will be conducted at Tangail in Bangladesh from Saturday. The 14-day exercise will be the 8th edition of the exercise which is hosted alternately by both countries. Aim of Sampriti 2019 : To strengthen and broaden the aspects of inter-operability and co-operation between the Armies of both countries. 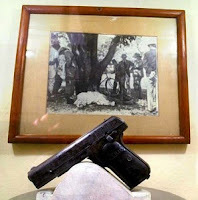 Nation paying tribute to martyr Chandrashekhar Azad (23rd July 1906 – 27th February 1931) on his 89th Death Anniversary today. 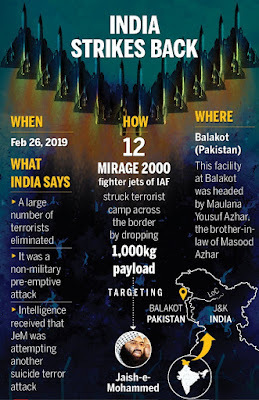 Hindu Editorial Topic 1 : "Pushing boundaries: on Balakot air strikes"
In a big overnight operation, Indian Air Force (IAF)’s Mirage 2000 fighter jets have completely destroyed multiple terror camps in Pakistan. 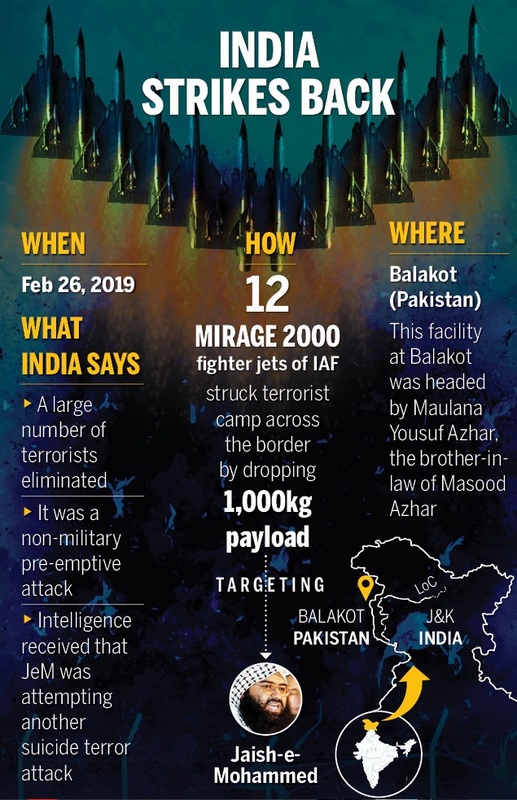 IAF jets destroyed the biggest training camp of Jaish-e-Mohammed (JeM) in Pakistan's Balakot in the strike carried out by 12 Mirage 2000 fighter jets. 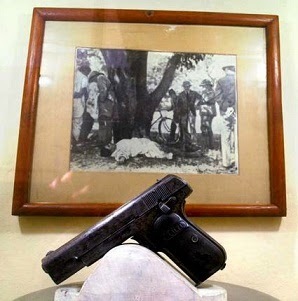 The JeM camp was run by the terror group's chief Masood Azhar's brother-in-law Yusuf Azhar. A very large number of JeM terrorists, trainers and senior commanders were eliminated in the strike. Note : The air strike is the 1st time Indian Air Force has been used in Pakistan-controlled airspace after the 1971 Indo-Pak war. Kim Jong-un became the 1st leader of North Korea to travel to Vietnam since his grandfather, Kim Il-sung, visited in 1964. Kim arrived today for a summit with US President Donald Trump. The 2nd high profile summit between US President Donald Trump and North Korean leader Kim Jong-un will take place in the Vietnamese capital Hanoi tomorrow. During their two days of talks, the two leaders are expected to have several rounds of discussions in multiple settings, including a one-on-one, aimed at normalising ties and complete denuclearisation of the Korean peninsula. They are also likely to review the progress made after their first historic summit in Singapore last summer. 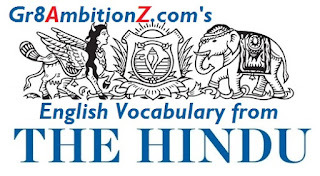 Hindu Editorial Topic 1 : "Before eviction: on SC verdict on forest-dwellers"
US President Donald Trump will reach Hanoi (Capital city of Vietnam) tomorrow for his 2nd summit with North Korean leader Kim Jong-Un. The summit is due to take place on Wednesday and Thursday but details of the talks have not been released. The North Korean President, Kim Jong-Un is going to reach Hanoi by train from Pyongyang. Note : The Vietnam summit is a follow-up to a meeting in Singapore last June. Ramesh Kumar Vankwani, a Hindu parliamentarian from Pakistan, met Prime Minister Narendra Modi and Union Minister Sushma Swaraj at an event in Delhi. The MP assured the ministers that Pakistan had no involvement in the Pulwama attack. Note : Vankwani was part of a foreign delegation invited to India to attend the Kumbh Mela by the Indian Council for Cultural Relations. A ceremony was held in Tokyo (Japan) to celebrate 30 years of Emperor Akihito's reign. Prime Minister Shinzo Abe, the Speaker and President of both chambers of the Diet and foreign ambassadors to Japan also attended the event on Sunday. Note : Emperor Akihito is schedule to abdicate on April 30 and Crown Prince Naruhito's accession is set on May 1. Sudanese President Omar al-Bashir has declared a year-long state of emergency, dissolving his cabinet and local governments throughout the country. His announcement followed months of nearly daily protests against his rule, with thousands of people taking to the streets across the country since December 19 to call for him to stand down after nearly three decades in office. Prime Minister Narendra Modi unveiled the National War Memorial near India Gate in New Delhi today. The memorial honours soldiers who have laid down their lives in the service for the country since Independence. Spread over 40 acres, the project has been executed at a cost of Rs 176 crore. Rakshak Chakra - Circle of Protection. 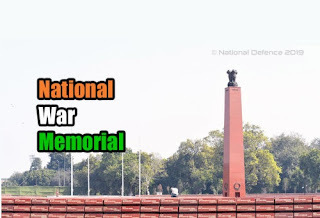 The complex includes a central obelisk, an eternal flame and six bronze murals depicting famous battles fought by Indian Army, Air Force and Navy. Busts of the 21 awardees of Param Veer Chakra have been installed at Param Yoddha Sthal. Railways Minister Piyush Goyal today launched the 'Rail Drishti Dashboard (e-Drishti)', an online portal containing information related to passenger and freight trains and links to live feeds of IRCTC kitchens. The Dashboard has been launched to keep people informed about the work going on in the Railways across the country. The United Nations Entity for Gender Equality and the Empowerment of Women has praised Odisha government for proposing 33% reservation for women in Parliament and Assemblies. Note : Andhra Pradesh had also passed a proposal for women's reservation in 2016. The Ministry of Home Affairs increased the Risk and Hardship Allowance for CAPF (Central Armed Police Forces) personnel from ₹9,700 to ₹17,300 per month for those up to the Inspector rank. For those above Inspector rank, allowance was increased from ₹16,900 to ₹25,000. Note : Over 88,000 CRPF personnel in the LWE states and J&K will benefit from this move. Union minister Ashwini Kumar Choubey launched a national programme aimed at eliminating viral hepatitis, recognized as an important public health problem. The minister of state for health launched the National Action Plan - Viral Hepatitis at Mumbai in presence of Amitabh Bachchan, the goodwill ambassador for hepatitis, WHO South-East Asia Region. Aim of this Programme : To combat hepatitis and achieve countrywide elimination of Hepatitis C by 2030. The government of Himachal Pradesh today announced Monkey as Vermin for the period of one year in 11 districts of the state. Gujarat government has launched the 2nd edition of the water conservation scheme Sujalam Sufalam Jal Sanchay Abhiyan. Aim of this Scheme : To deepen water bodies in the state before monsoon to increase storage of rainwater to be used during times of scarcity. 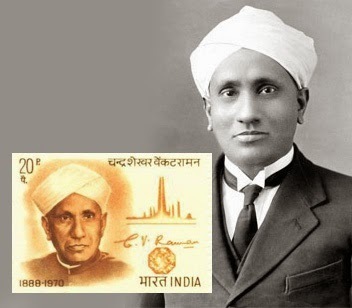 The Indian government today declared that the Printing presses and mints as public utility service under the Industrial Disputes Act, 1947. Note : The notification is valid for six months and can be reissued after expiry. The new draft e-commerce policy has proposed a ban on all gifts shipped to India via e-commerce route to prevent misuse of 'gifting' provision. Indian customs law allows up to ₹5,000-tax exemptions on gifts sent to India from abroad. Several Chinese e-tailers including SheIn and AliExpress reportedly misused this rule to ship cheaper products to Indian users. The GST Council announced under construction properties priced over ₹45 lakh will invite 5% GST, instead of 12%. A residential property priced at ₹45 lakh or below will now be defined as "affordable" and taxed at 1%, from 8% earlier. Further, a property of 60 square metres in metro cities and 90 square metres in non-metros will be considered "affordable". At the inauguration of the new export route in Zaranj city in western Nimroz province, President Ashraf Ghani said Chabahar port is the result of healthy cooperation between India, Iran and Afghanistan. Haryana Finance Minister Capt Abhimanyu presented the Rs. 1,32,165.99 crore tax free budget for 2019-20 in the State Assembly today. It is 14.73 percent over Budget Estimates and 9.79 percent over revised estimates of 2018-19. Over Rs. 46, 000 crore have been allocated to 15 Sustainable Development Goals being implemented in the state. Although no new tax is imposed, Finance Minister has proposed to raise revenue receipts of Rs 82,219.41 crore in 2019-20 through efficient realisation of tax and non-tax receipts over revised estimates of 2018-19 receipts of Rs 76, 828.11 crore. Multinational professional services network, Deloitte has announced the launch of its global initiative ‘WorldClass’ in India for the empowerment of women. The initiative was launched by Deloitte’s Global CEO, Punit Renjen in the presence of Dharmendra Pradhan, Minister of Petroleum and Natural Gas and Skill Development and Entrepreneurship. NITI Aayog co-hosted a conference on “The Future of Indian Banking”, with the Foundation for Economic Growth and Welfare (EGROW Foundation). The conference was inaugurated by Dr Rajiv Kumar (Vice Chairman, NITI Aayog). Aim of this Conference : Increasing and elevating the discourse on the banking sector in India and help in developing insights to inform the continued evolution of the Indian banking sector for optimally supporting the growing credit needs of the Indian economy. 'Green Book' was named Best Picture at Oscars 2019, while 'Roma' director Alfonso Cuarón was named Best Director. India-based 'Period. End of Sentence.' has won the Oscar for Best Documentary Short Subject.